No summer can ever quite be as glorious as the ones you remember from when you were young, when a sunny afternoon seemed to last forever and all there was to do was ride your bike, eat ice-lollies and play with Lego. Tom Braudy is enjoying just such an afternoon when the TARDIS lands in his Nan’s living room and interrupts her in the middle of the snooker. After they’ve apologised, the Doctor and his friends soon discover matters of far greater concern than the fact that their time machine is blocking Mrs Braudy’s view of a thrilling century break. The street which Tom happily cycles up and down appears to have no beginning or end, and every single house on it is identical. Is this the future of suburbia, or something even more sinister? Why doesn’t Tom look as young as he behaves? And can anybody remember which house the TARDIS is in? 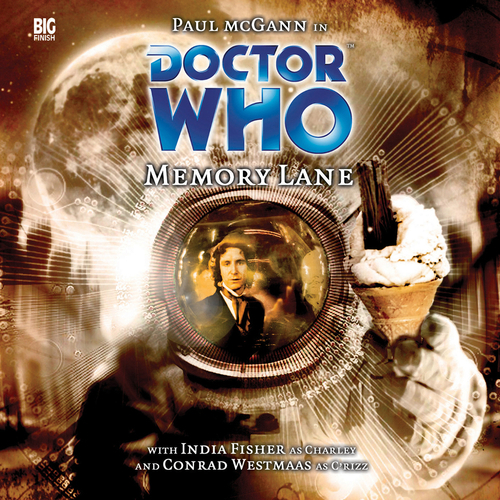 Paul McGann is the Doctor in Memory Lane. Everyone has their one perfect day, and it comes in two different forms. Memory Lane takes that one perfect day and twists it into the perfect prison. Using the tried and true formula of taking a familiar setting and slowly upping the uneasiness factor, Eddie Robson turns in a story that goes the extra mile by giving C’rizz a vital role. It’s a relatively lighthearted and fun story with some good dialogue, stumbling only during a sequence where the Eighth Doctor is once again tortured via his captors messing around with his memories. It’s summer in English suburbia. There’s snooker on the telly, an ice cream truck playing “Greensleeves” rolls up and down the street, and 10-year old Tom Braudy is enjoying himself as he builds a spaceship out of Legos. The idyllic setting, however, isn’t as perfect as it seems. One, Tom looks much, much older then he claims to be. Two, his nan is completely nonplussed by the arrival of the TARDIS smack dab in the middle of her living room. Three, the house next door is identical to the one the TARDIS has landed in, complete with its own version of Tom’s nan. Four, the house next door to that one is identical, and so on down the block for distances unending. Five, there’s a movie playing on the television in between the snooker commentary about two astronauts trying to escape from a creature on board their spaceship. Six, one of those astronauts is snooping around the neighborhood. 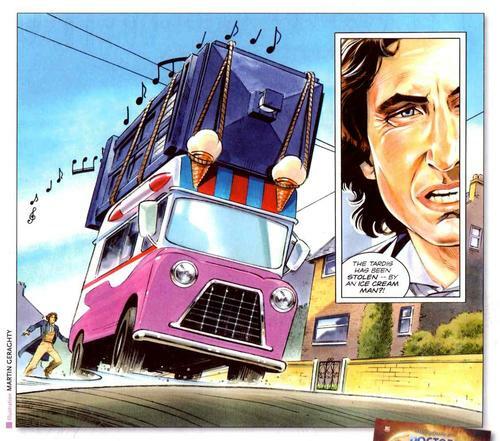 And last, the TARDIS has been stolen…by an ice cream man?!? The Doctor: Never turn down tea. It’s impolite and wars have begun that way. Kim: There she is! My ship! The Led Zeppelin IV! Kim: …there was a public vote to name her. The Doctor: Well, that’s democracy for you. Even the sound makes thing seem more familiar and more sinister. The sounds of snooker in the background, the chimes of the ice cream truck, the sounds of a hand shifting through Legos looking for that perfect piece, David Darlington once again helps Big Finish turn in its standard “solid-to-amazing” level of sound and post-production work. While there have been a few lighthearted moments through his run, (Seasons of Fear and Faith Stealer), the last “easy going” audio for the Eighth Doctor was the Mark Gatiss piece Invaders from Mars. After the events of Neverland, Zagreus and the Divergent Universe arc, it was time for Eight to get a little bit of a breather. Paul McGann’s sparkles in this story, gleeful and inquisitive in a way that hasn’t been seen since his very first series. He’s excited about the ice cream van, and puzzled over the endless suburban street that stretches out around him, but instead of brooding or worrying deeply over it, McGann is simply…the Doctor. He keeps a grin on his face and his spirits high, save for a few moments where he reminds people just why he’s the Doctor, such as putting Kim in her place when she reveals she shot Nan out of frustration and found out that Nan always got back up after…repeated experimentation. And, of course, there’s Eight being tortured where he simply shrugs it off and encourages his captors to do their worst. It’s been a while since I’ve had a chance to say this, so I’m very pleased to say that Memory Lane strikes me as a story where McGann is just having FUN playing the Doctor. The supporting cast easily pulls their weight. There’s no standouts, but there isn’t any dead weight either. Neil Reidman, who played Atillo in the Tenth Doctor television story Utopia, plays Tom, the captive astronaut. Tom plays both the carefree child and the nervous captive very well. The part where he abandons the Doctor and Charley doesn’t portray Tom as a coward, just a very scared and confused man. Nina-Baden Sempter plays Ms. Braudy, the loving and doting nan/grandmother to Tom, and the way she just plays along with all the newcomers to Tom’s prison, no matter how absurd the situation, is a delight. Charlie Ross and Neville Watchurst play the jailors Lest and Argot. You never get the sense that either man is sinister, but instead two competent employees, with Lest barely managing to keep the prison running and Argot always being reminded to take notes because he never remembers anything, both plot points that come back around during the lead up to the story’s climax as we discover WHY Tom has been kept captive. My main problem with the story comes with a sudden shift in tone over two or three segments, as the Doctor sneaks Tom into the TARDIS and Lest and Argot have to figure out how to open the TARDIS doors to get Tom back out. They get a hold of the Doctor, put him in his “perfect moment” where he’s just saved the day and his companions praise him for it…and then the Cloister Bell rings, Charley and C’rizz are flung into the Time Vortex, and Lest tells the Doctor that unless the Doctor tells him how to open the TARDIS doors, he’ll lock the Doctor in a memory loop where the Doctor will continue to experience the horror of his companions being ripped away from him like it’s the very first time. In that moment, Lest and Argot go from bumbling prison employees into ruthless con men, with the light tone of the story completely gone. Charlie Ross channels a cruel villain as he tries to break the Doctor, all characterization erased for a few scenes. It’s very jarring and threatens to throw the whole tone of the story off. The Doctor shrugs it off, C’rizz saves the day…and the Doctor gives the pair the technology to ensure the prison is no longer needed and tells C’rizz that revenge is best thrown into the rubbish bin. Some listeners might not notice the shift in tone, but others might be a bit taken aback. Memory Lane could best be seen as a bit of a “breather” story. Following the claustrophobic Something Inside and leading up to the events of Absolution, this is a lighthearted, easy going fun story. Save for the scenes of mental torture, the actors seem to have had a blast making this story, with everyone in their place, the TARDIS crew all getting their moments in the sun, some absurd dialogue, and a drop of the Doctor’s mercy and compassion to top it off. Easily recommended, Memory Lane is an audio that might not be the “perfect” story, but instead uses the setting of a “perfect day” very well. Synopsis – Turning out to be C’rizz’s best story, the Doctor and his companions deal with a prison that recreates someone’s “perfect day” and a jailor who’s none other than the local ice cream man, all helping to make Memory Lane a fun, lighthearted story (for the most part). Sylvester McCoy is the Doctor in…No Man’s Land. This entry was posted in Big Finish Review and tagged Big Finish, Big Finish Audio, Big Finish Review, C'rizz, Charley Pollard, Conrad Westmaas, Doctor Who, Doctor Who Audio, Doctor Who Review, Eighth Doctor, India Fisher, paul mcgann, TARDIS. Bookmark the permalink.